People who felt powerless in the face of poverty and climate change have had their hope restored and thanks to FMNR they are empowered to take charge of their future. In developing countries many farmlands and landscapes have become so degraded that they no longer produce regular crops or provide pasture for livestock. These degraded lands have lost virtually all of the natural vegetation necessary for maintenance of soil fertility and biodiversity or for the regulation of the water cycle. In many of these regions subsistence farmers account for 70 per cent or more of the population. With increasing variability of the weather and increasing frequency and severity of drought, more of these people will face hardships and food insecurity, more often. Yet, appearances can be deceptive. Vast tracts of seemingly treeless land, ranging from deserts to farmlands to degraded forests, conceal an ‘underground forest’ of sprouting tree stumps, roots and seeds with the potential to rapidly restore a healthy cover of trees on landscapes, given the correct conditions. 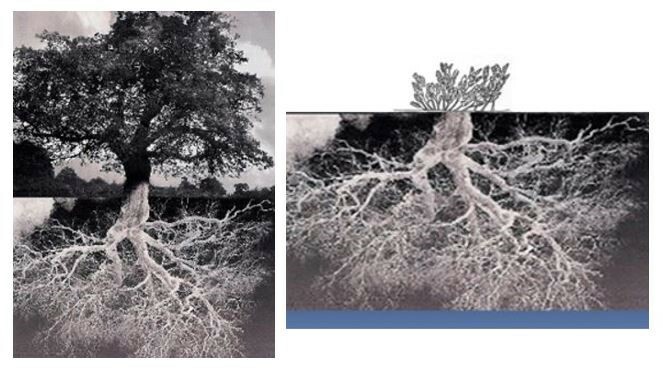 Above: Diagram representing extend of underground tree roots. When a tree is felled, for most species, much of the root mass remains alive. Many tree species have the capacity to regrow rapidly from the stump due to access to soil moisture and nutrients and a store of sugars in the roots. Felled trees constitute ‘underground’ forests, because we do not see them and tend to discount the potential of the seemingly insignificant shoots that sprout from stumps. Deforestation has both a direct and indirect impact on poverty, malnutrition, conflict, terrorism, climate change, and the growing refugee crisis. Farmer Managed Natural Regeneration (FMNR) is a low-cost, sustainable landscape restoration technique used amongst poor subsistence farmers to combat poverty and hunger. 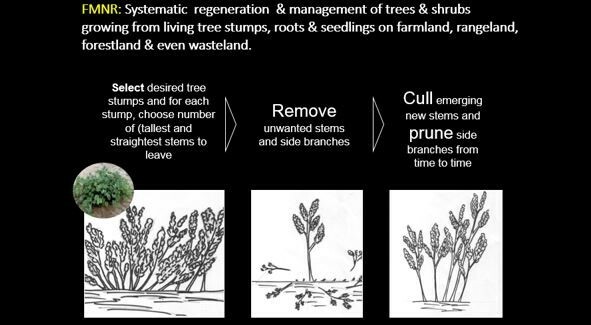 It involves the systematic and farmer-selective regeneration and management of naturally-occurring trees and shrubs from stumps, roots and seeds. In other words, it is a natural agroforestry system – rather than plant trees, FMNR uses what is already in the ground. Above: FMNR involves the selection, pruning and management of growth from tree stumps, roots and seeds. By restoring trees to the landscape, erosion is decreased, soil moisture and fertility are increased, paving the way for increased food and timber production, a return to biodiversity and resilience to climate extremes. 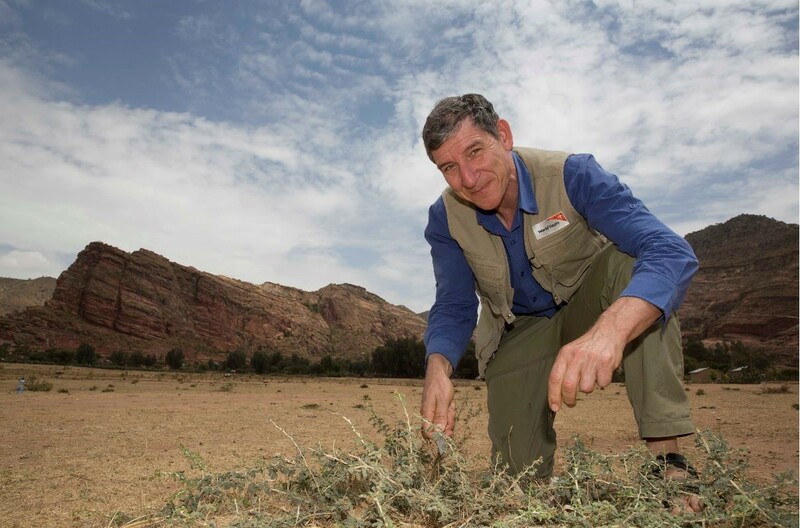 FMNR helps individuals and communities achieve economic sustainability for their households through the environmental repair of their farmlands and the surrounding bushland. This method has doubled crop yields and family incomes, provided timber for building, cooking and keeping warm, restored degraded soils and helped communities become more resilient and adapt to climate change. FMNR reduces reliance on food relief. But FMNR is not simply a technical approach. Its success lies in working with communities to build an enabling environment that allows them to develop their capabilities in organisation, networking, dealing with authorities, and creating governance systems. Individuals and communities which had lost hope and who felt like helpless victims of poverty and climate change are being empowered to address their situation. Many are realizing that God has given them everything they need to do something very tangible and significant. FMNR does not create dependency and it is bottom up, putting individuals and communities firmly in the decision making seat. In a very real sense, FMNR is giving people back their dignity and sense of belonging. As a Christian developing and promoting FMNR globally I have had the great joy of seeing many thousands of people benefit as they come to appreciate and begin to care for God’s creation. FMNR is a low cost, rapid and scalable tool which enables even the poorest families to benefit as they become stewards of God’s creation.